Nagy, N., Froidevaux, A., & Hirschi, A. (2018). Lifespan perspectives on careers and career development In B. B. Baltes, C. W. Rudolph, & H. Zacher (Eds. ), Work Across the Lifespan (Vol. 1): Elsevier. 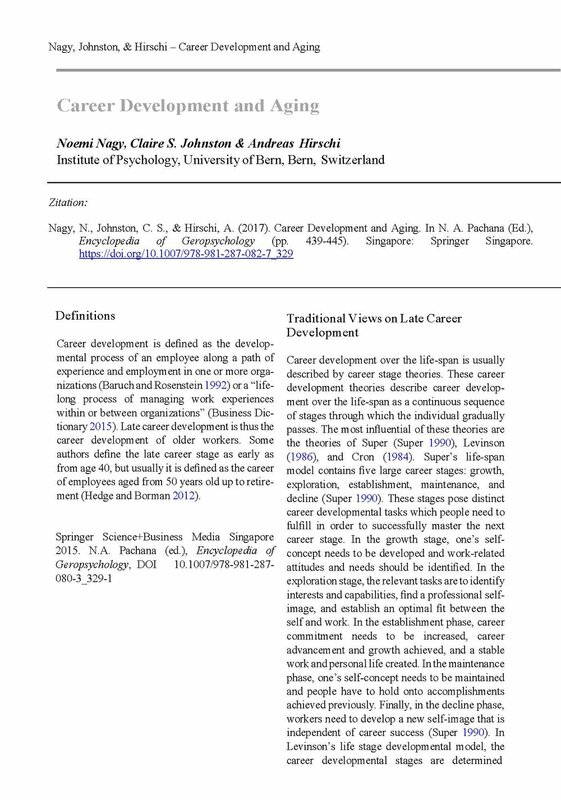 This chapter intends to contribute to a better understanding of career development over the lifespan by examining individual and contextual factors contributing to life-long career development. Considering manifold changes in the work environment as well as throughout an individual’s career, we review classic theories of career development in the beginning of this chapter. We then describe changes in today’s careers, and depict modern career theories, such as the protean or the boundaryless career. Subsequently, we elaborate on sources of change over the lifespan from an individual perspective: We explain how changes in personality, work values, or goal setting influence career development. From an organizational perspective, we describe how changes in the psychological contract or various age norms may influence the career development of employees. In the last part of this chapter, we outline central career developmental issues for individuals over the lifespan and point out recommendations for organizations in order to help promote meaningful, fulfilling, and sustainable career development over the lifespan. Nagy, N., Johnston, C. S., & Hirschi, A. (2017). Career development and aging. In A. N. Pachana (Ed. ), Encyclopedia of Geropsychology (1-7). Singapore: Springer Singapore. Froidevaux, A., & Hirschi, A. (2015). Managing the Transition to Retirement: From Meaningful Work to Meaning in Life at Retirement. In A. De Vos, & B. van der Heijden (Eds. ), Handbook of Research on Sustainable Careers (pp. 350-363). Cheltenham, UK and Northampton, MA, USA: Edward Elgar Publishing. Hirschi, A., & Dauwalder, J.-P. (2015). Dynamics in career development: Personal and organizational perspectives. In L. Nota & Rossier, R. (Eds. ), Handbook of the Life Design paradigm: From practice to theory, from theory to practice (pp.27-39). Boston, MA: Hogrefe. Hirschi, A, (2011). Berufswahlfreiheit als Selbstgestaltung beruflicher Entwicklung. Neue Forschungen aus dem angelsächsischen Raum [Career choice volition as self-determination of career development]. In R. Marty, D. Jungo, R. Zihlmann (Eds. 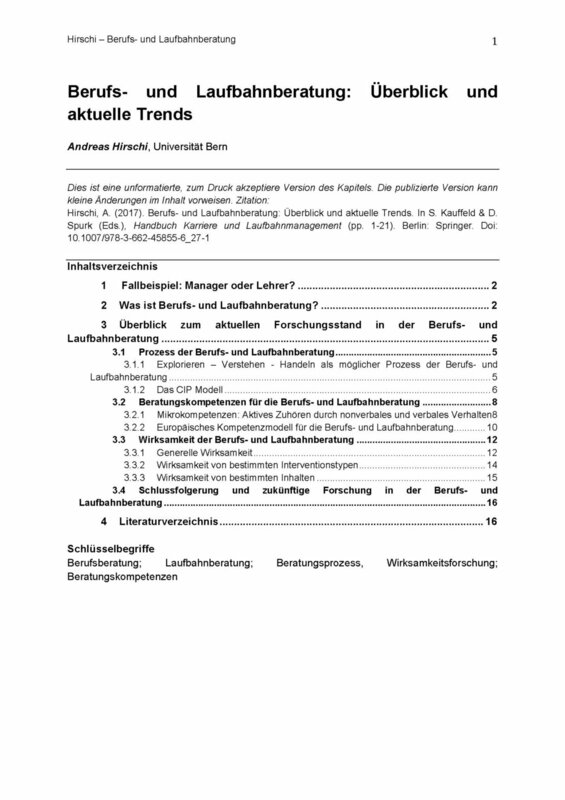 ), Berufswahlfreiheit – Ein Modell im Spannungsfeld zwischen Individuum und Umwelt (pp. 99-110). Dübendorf, Switzerland: SDBB. Hirschi, A. & Läge, D. (2010). READY! Un programma per stimolare la prontezza decisionale [READY! A program to boost decision readiness]. In L. Nota & S. Soresi (Eds. ), Sfide e nuovi orizzonti per l’orientamento (pp. 267-282). Florence, Italy: Giunti O.S. Organizzazioni Speciali. Hirschi, A, (2010). Vocational exploration: Multivariate predictors and effect on confidence development in adolescence. In H. Ohlsson and H. Borg (Eds. ), Career development. Hauppauge, NY: Nova Science Publishers. Mpofu, E., Bishop, M., Hirschi, A., Hawkins, T. (2010). Assessment of values. In E. Mpofu & Oakland, T. (Eds.). Rehabilitation and health assessment: Applying ICF guidelines (pp. 381-407). Boston, MA: Allyn & Bacon.